Use the below images as a guide to see all of the color options side by side. 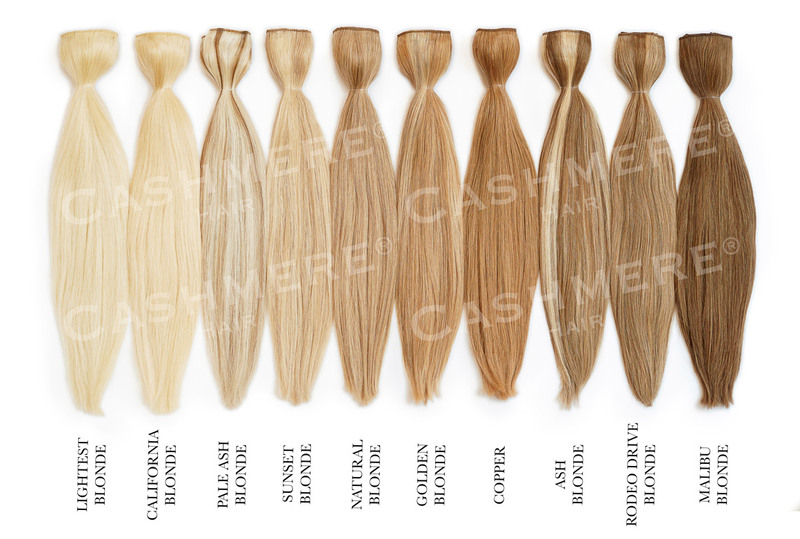 We have 10 gorgeous multi-tonal shades to blend with a wide variety of blondes, including solid and highlighted shades. OUR LIGHTEST SHADE OF BLONDE. Least amount of warmth in this shade. A PALE GOLD BLONDE. Slightly more pigmented than the Lightest Blonde shade with warm/yellow understones. LIGHT BLONDE WITH SUBTLE ASH BLONDE LOWLIGHTS. Overall lighter shade and less lowlights than in the regular Ash Blonde shade. BEIGE MEDIUM BLONDE INTERMIXED WITH LIGHT NEUTRAL BLONDE HIGHLIGHTS. This shade is our most popular shade of blonde & it blends seamlessly with most light blonde highlighted shades. A MEDIUM NEUTRAL HONEY BLONDE. A MULTI-TONAL MEDIUM BLONDE SOLID SHADE WITH NO HIGHLIGHTS. This shade blends well with natural medium blonde hair. WARM MEDIUM BLONDE WITH STRAWBERRY UNDERTONES INTERMIXED WITH LIGHTER GOLDEN BLONDE HIGHLIGHT. Great for warm blonde shades & blends well with strawberry blondes with highlights. A DIMENSIONAL LIGHT COPPER RED TONED SHADE. Matches great with Strawberry Blondes and light redhead shades. A BLEND OF MEDIUM BROWN/DARK BLONDE HIGHLIGHTED WITH PALE BLONDE. High constrast blonde with a dark blonde lowlight. MEDIUM-DARK BLONDE INTERMIXED WITH NATURAL BLONDE. A NATURAL BLONDE WITH ASH UNDERTONES. A good match for dark blonde shades with subtle highlights. DARK BLONDE/VERY LIGHT BROWN. This shade appears to be a neutral shade that will blend great with both dark blondes or light brunettes. We have a variety of rich multitonal brunette shades including solid and highlighted shades. N°. 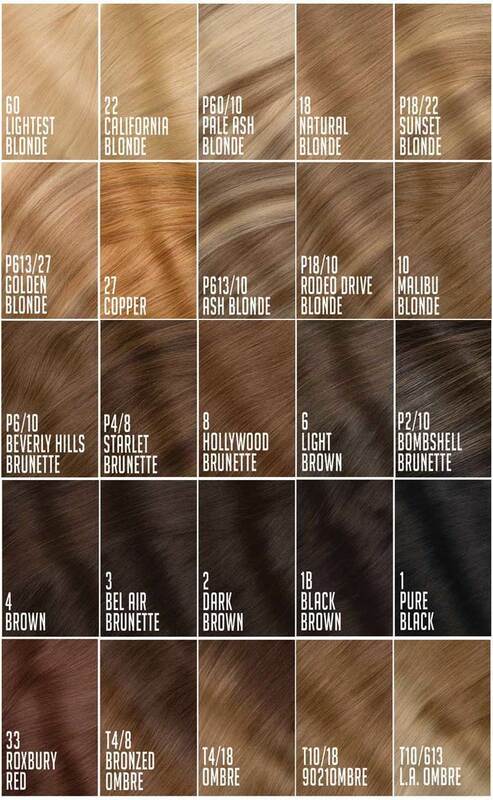 P6/10 LIGHT-MEDIUM BROWN INTERMIXED WITH DARK BRONZE BLONDE. GREAT FOR BRUNETTES WITH HIGHLIGHTS, OMBRE AND MULTI-TONAL BROWN HAIR. Naturally Highlighted shade that seamlessly blends with the light to medium brunette. A SOLID SHADE OF LIGHT BROWN. This shade can appear to have warm undertones. WARM TONED BRONZE-BROWN SHADE. Great for warmer brunettes and blends well with natural redhead shades. RICH MEDIUM BROWN WITH WARM UNDERTONES MIXED WITH A LIGHT BROWN HIGHLIGHT. A great shade for darker brunettes with highlights. DARK BROWN MIXED WITH DARK BLONDE HIGHLIGHTS. Highlights appear very subtle. A great match for dark brunettes with a slight highlight. RICH MEDIUM BROWN WITH WARM UNDERTONES. This is a solid warm brown shade with rich hues. MEDIUM DARK BROWN SHADE WITH WARM UNDERTONES. Slightly darker than our Brown shade and lighter than our Dark Brown shade. DARK BROWN WITH SUBTLE WARM UNDERTONES. BLACK BROWN. A NEUTRAL BLACK BROWN SHADE THAT IS OFTEN REFERRED TO AS A SOFT BLACK BROWN. We are proud to offer 4 different shades to blend with the latest Ombre & Balayage trends. OMBRE CONSISTING OF 4-6 INCHES OF MEDIUM BLONDE ROOTS FADING INTO COOL LIGHT BLONDE ENDS. Our Ombre shades provide that highly sought after graduation, without the maintenance associated with most Ombre styles. A great option for blonde ombre hair. 4-6 INCHES OF DARK BLONDE ROOTS FADING INTO NATURAL BLONDE (MEDIUM HONEY BLONDE) ENDS. This technique is called "Rooted" and is a very natural and subtle ombre. Our Ombre shades provide that highly sought after graduation, without the maintenance associated with most Ombre styles. A great option for medium to dark blonde ombre hair. 4-6 INCHES OF MEDIUM BROWN ROOTS FADING INTO NATURAL BLONDE ENDS. 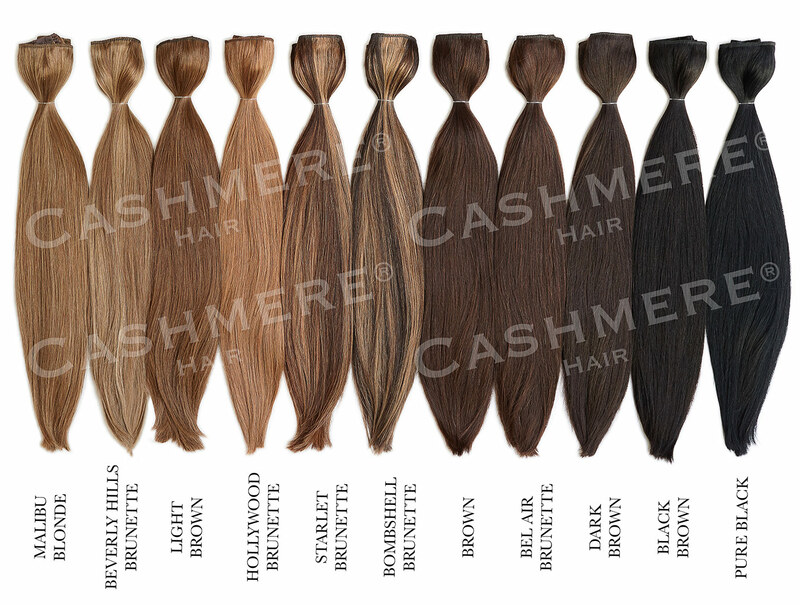 Our ombre shades provide that highly sought after graduation, without the maintenance associated with most ombre styles. A great option for achieving the popular contrasting look of ombre. 4-6 INCHES OF MEDIUM BROWN ROOTS FADING INTO LIGHT BROWN ENDS. Our Bronzed Ombre shade provides that highly sought after graduation, without the maintenance associated with most Ombre styles. A great option for medium to dark brown ombre hair. 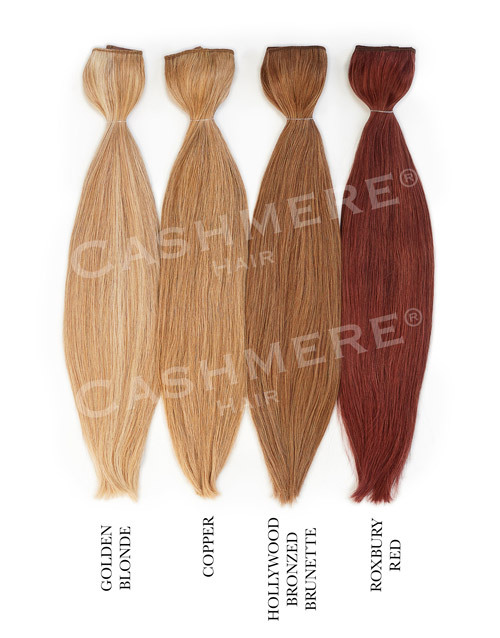 We are proud to offer 4 different shades to blend with our redheads and strawberry blondes. WARM MEDIUM BLONDE WITH STRAWBERRY UNDERTONES INTERMIXED WITH LIGHTER GOLDEN BLONDE HIGHLIGHT. Great for warm blonde shades & blends well with strawberry blondes with highlights. Golden Blonde is similar to our Copper shade, but with light blonde highlights throughout. WARM TONED BRONZE-BROWN SHADE. Great for warm toned brunettes and blends perfectly with natural redhead shades. GLOSSY RICH MEDIUM RED AUBURN SHADE. A great color choice for colored/dyed darker redhead shades & can easily be enhanced to for your desired red shade.